These wonderful videos are being provided with permission from Debbie Martin (click the link to learn more about Debbie), a registered veterinary technician and certified pet dog trainer from Veterinary Behavior Consultations, LLC. Debbie made these videos for a presentation through the American Animal Hospital Association (AAHA) and also presented them at the North American Veterinary Conference (NAVC), they are from the Veterinary Behavior Consultants Video Resource webpage. These videos demonstrate training independence and desensitization to owner departure cues as part of a treatment for Separation Anxiety. Debbie uses the Treat and Train System (formerly called the Manners Minder) in her training and in many of these videos, this is a remote treat dispenser developed by Veterinarian and Animal Behaviorist, Dr. Sophia Yin. 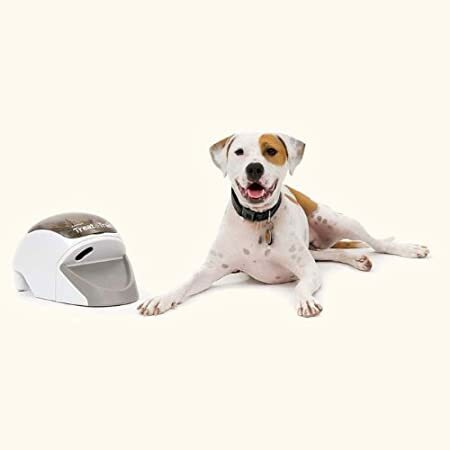 Video #2: Remote treat dispenser to reward staying on the mat: A Treat and Train or Manners Minder (remote treat dispenser) is used to reward the dog for remaining on the mat, while the owner walks away. The owner has a remote that controls when the machine dispenses the treat. This also disassociates the reward from the owner.